What do you do when you feel like you are out of shape? You must never give up, just look at the new world trade center. To me, it will never be as beautiful as the original which I watched being built from my seventh floor apartment in the Pomonok housing projects in Queens. Every day I woke up to seeing the City, the Skyline of Manhattan and loved watching the changing view as the towers were built. This is why the skyline of Manhattan reminds me of my childhood. 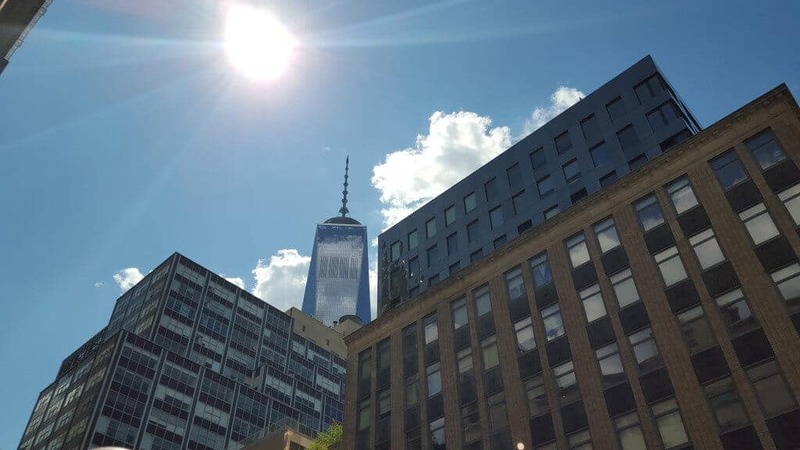 But the new world trade center can also be considered more beautiful, because it is a symbol of never giving up and rebuilding. So for all of you weekend warriors and athletes and former athletes, if you think that you need to get back into shape or into better shape, then this blog is for you. Hashi Mashi is all about not giving up, getting stronger in mind and body one day at a time no matter what our age or circumstances. Now onto what I am calling the First Avenue Workout. First avenue in New York City really does not get alot of love. Of course Madison avenue does. But what about first avenue, the first avenue over from the East River? That could be the reason that first avenue does not get alot of love. In any case, I have decided to name my workouts so that someone else can get some use out of them as well. But I really did not want to keep repeating what is in a workout other than giving the workout a label, this way we can just refer to the workout name and know what the workout it. So first I thought of naming workouts by the avenues in the City, or by streets, even by neighborhoods and of course, first avenue was not on my radar. The east river is supposed to be the place where many people have ended up when they were not in such good shape, either cause of debts or some other turmoil that leads a person to careen off of the Brooklyn Bridge. So since the east river is the ending point for people not in shape, I thought lets name the first workout by the name “1st Avenue or First Avenue”, because this workout is the beginning of getting back into shape so that we do not end up in the east river. From now on, I will only refer to this workout by the name First Avenue and every time you see First Avenue, you will know which workout I am referring to. No, I did not invent this workout. I mentioned elsewhere that I am attempting to get stronger based on the book Starting Strength by Mark Ripptoe, so he gets all the credit for the strength training routine. Today was the third day of my doing the First Avenue Workout. You must warm up, so after you do your warm up sets, then do 3 working sets of 5 repetitions of the above strength training exercises. Last Wednesday I began with Squats of 95lbs, went up to 100lbs on friday and 105lbs today. Make sure that you read how to prevent knee pain after squats because that is where I write the latest information that I have on doing squats with good form and so far so good. For presses I started with 3 sets of 5 reps of 55lbs and today did 2 sets of 85lbs. I will hold at 85lbs till I can do 3 sets. For Deadlifts I began with 1 set of 5 reps using 135lbs, then friday 155lbs and today 160lbs. Make sure that you warm up before your squats, walking, elliptical, stretching. Do 5 – 10 air squats with no weight and when you squat to the bottom position, push your knees out with your elbows to increase your flexibility. Now you have done 5 warm up sets and are ready for your work sets. Of course if these weights are too light for you, just use the poundage that works for you. The point is to get a good warm up in of about 5 sets before doing your working sets. The working sets is with your maximum poundage that you are capable of doing 3 sets of 5 repetitions. If possible, try to increase the poundage of your working set every other day, meaning Mon, Wed and Friday with the weekends off. So far I have done 3 “First Avenue Workouts” and have gone up 5lbs, which is by using fractional plates from 95lbs to 100lbs and today to 105lbs for the working set. Most gyms have at least 2.5lb plates which you can add on to either end of the barbell to go up 5lbs. If you have 1.25lb plates, then use those if you cannot go up 5lbs. If you cannot increase the weight of your squats on your working sets, then at least maintain where you are. This is an easy transition, the bar is already on the rack for squats and all you have to do is take off the weights and begin to do your warm up sets for the shoulder press. Last week I tried to do the shoulder press warm ups in between squats to reduce workout time but I think that was a mistake. I feel that I was stronger on squats today because I did not do any other exercises in between squat sets. For shoulder press, do the same 45lb warm up of 2 sets of 5 repetitions. Then add weight and reduce your reps to 4, 3, 2 and 1. Then do your working set of 3 sets of 5 reps. I have done 3 First Avenue Workouts since last wednesday and went up on the working sets from 65lbs to 75lbs to today 85lbs. For deadlifts, I am just doing one set of 5 repetitions after 1 warm up set of 135lbs. So the deadlift working set is 1 set of 5 reps, not 3 sets of 5 reps.
My working sets of deadlifts has increased from 135lbs to 155lbs to today 160lbs. At the moment, I am doing the first avenue workout every other day , monday, wednesday and friday with weekends off. Yes, I will be saying what the 2nd avenue, third avenue, Lexington, park avenue, madison, 5th, 6th 7th, broadway, 8th ave, 9th ave, 10th, 11th and 12th avenue are till we get to the Hudson River. Please comment and thanks for sharing your thoughts and expertise!